Motorcycle: Honda XR 200 from Nice-Bike at 550 Pesos per day. Deposit of 2000 Pesos and passport are required. 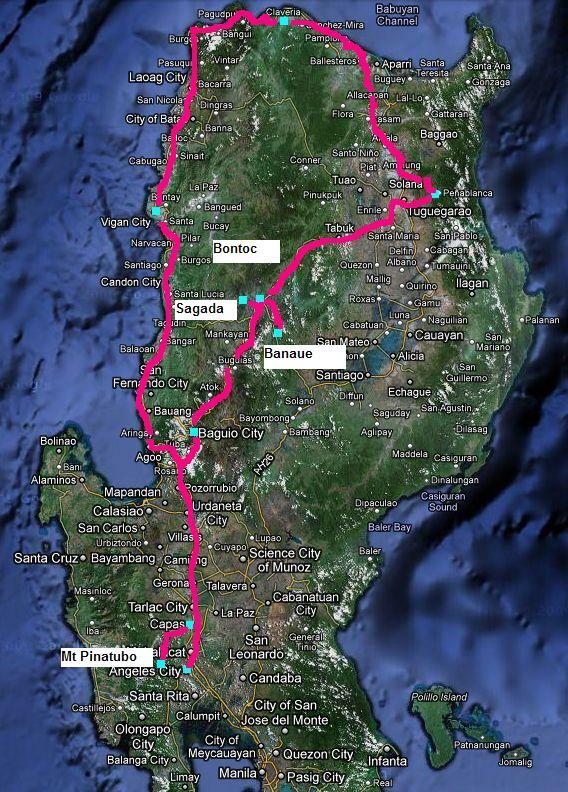 Anti-Clockwise loop around North Luzon, Philippines. Disclaimer: This trip was taken in February 2010. The information is provided ‘as is’ with no warranties and confers no rights. If you are interested to know more, please add a comment and I will update the post with more details. This entry was posted in Motorcycle Adventure Vacations, Philippines by atticus. Bookmark the permalink. Where did you rent your bike? Is the trip suitable for two on the bike (My girlfriend and me)? How many days is ideal? I am doing the trip right now, from the reverse, and I would suggest renting two Honda Waves instead of one XR 200 for the two of you. Really nice so far, and have not seen a single other foreigner today. I rented my bike from nice-bike at Angeles. If your gf can ride well, perhaps you can heed Hans’ advice to rent two waves which are easier to handle and allows you more space to tie your backpacks. Please try to spend more days than me. I would recommend at least 12 days for the ride.